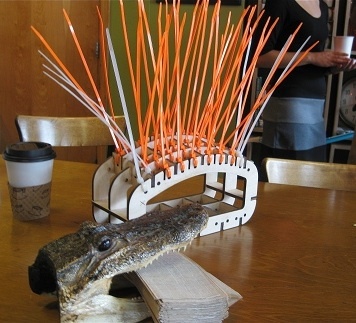 All of the local artists designing installations for the demo project are participants in PA:ID (Public Art In Depth), an intensive, multi-faceted program created by the City of Tacoma. Developed and facilitated by artist Elizabeth Conner, this powerful course is providing selected artists free training and detailed mentorship in how to apply for and advance through the process of creating public art projects. PA:ID participants are all artists who have attained a level of success in their profession, and were selected through an application process. The Prairie Line Trail opening exhibition is one of several projects of Metro Parks, Sound Transit and Artscapes that will be open exclusively to PA:ID participants in 2011 and 2012. The Prairie Line Trail is one of Tacoma’s most significant landmarks, yet until now a curiously unrecognized one. The Northern Pacific Railroad designated the now-unkempt, two-acre corridor as the western terminus for the transcontinental railroad in 1873. The pieces showcased in the inaugural project will be made from reclaimed, recycled (and preferably free) materials, honoring the Prairie Line’s place in Tacoma’s past and its future. A secondary show of the artworks may be in the works. Thoughtbarn's undulating sculptures pay tribute to the Prairie Line's environmental past. 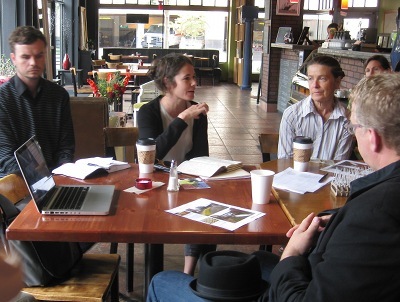 Thoughtbarn has been commissioned to create original public art to kick off the high-profile trail project in Nov., and unveiled their preliminary concepts at last week’s coffee klatch. 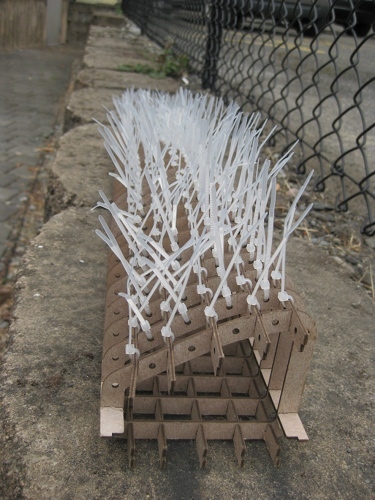 The architectural models, inspired by the Mima Mounds Natural Area Preserve, in Thurston County, suggest waving mounds of “prairie grass” rendered in industrial zip ties on clean armatures of industrial cardboard. 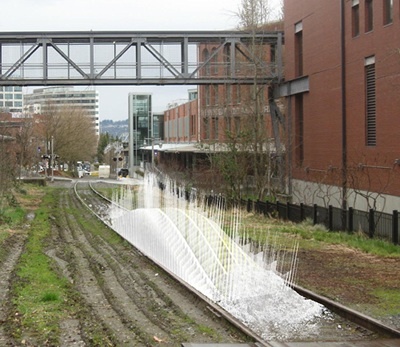 The enigmatic sculptural pieces, which will measure 4′ wide x 40′ long when finished, and will glow at night, “introduce a piece of ‘artificial prairie’ along the rails of the Prairie Line Trail in downtown Tacoma,” according to Gay and Begg. “It is a playful referral to both the railroad’s history and its new landscape-driven future as a bike-and-pedestrian path through the city.” The installation may include up to five mounds with final design and placement to be determined. The undulating forms are contoured with 15″ to 36″ zip ties that invite the touch. Thoughtbarn and Bressi note that the works designed under the public art plan must address the environmental challenges of the two-acre site. Though the team can identify aesthetic issues and community concerns (a major one being the fate of the United Way portion of the trail, adjacent to Tacoma Art Museum, which is under consideration for conversion into a parking lot), they do not design the trail or select participating artists. Power to the people: knocking around ideas at a public meeting. Robert Gay and Lucy Begg are Austin-based architects/artists; their multidisciplinary studio, Thoughtbarn, co-designed (with Jack Sanders and Leah Davis) the solar-powered way-finding system for the Lance Armstrong Bikeway, and public installations nationwide. Todd Bressi is an urban designer and planner who specializes in public art and cultural planning; he has taught public art, urban design and preservation classes at the University of Pennsylvania. 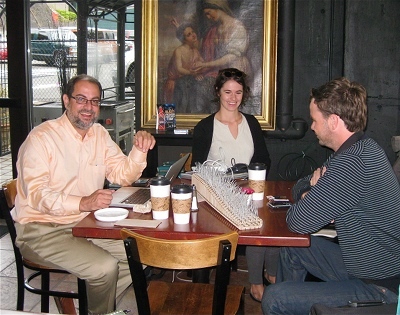 ← You’ll Like Tacoma Arts Month!